Hollister, CA – Corbin’s new Dual Touring saddle is just what you need to maximize the long range capabilities of your Victory Judge with enhanced comfort for two. 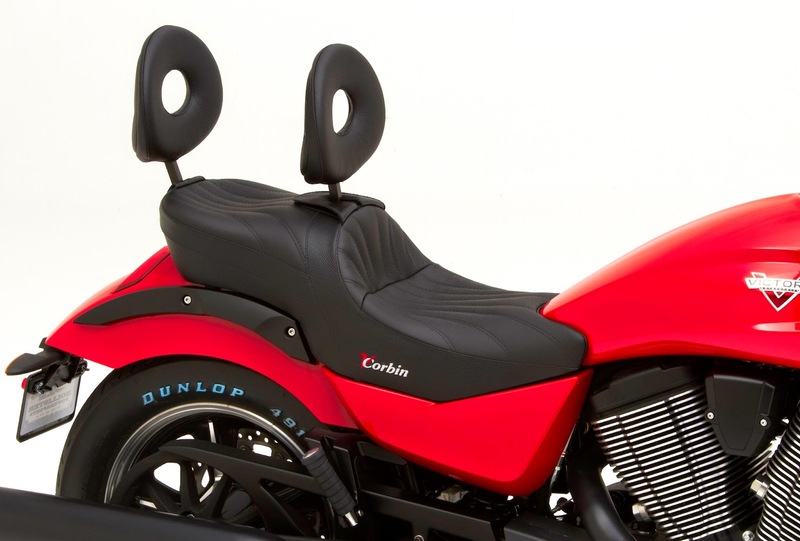 The ergonomically shaped seating gives riders excellent support for the long haul. The only reason you’ll find for stopping is the need for fuel. down action to ease mounting the bike. 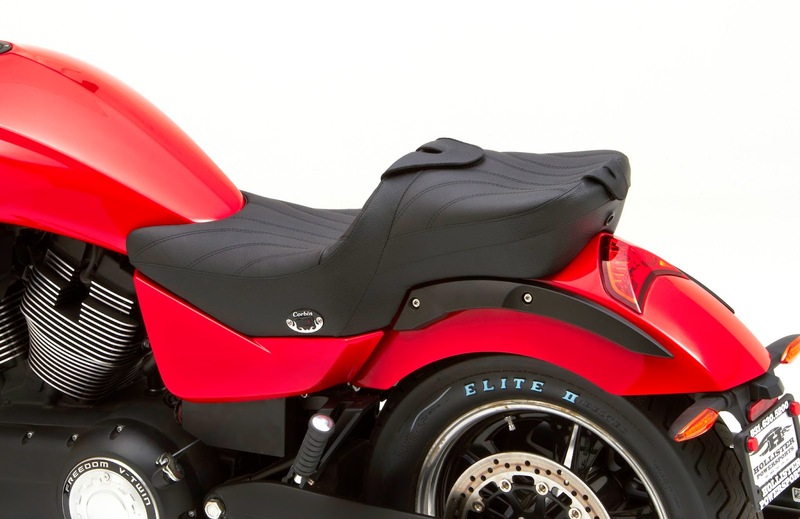 With backrest installed, the rider bucket offers 15 inches of vertical support! 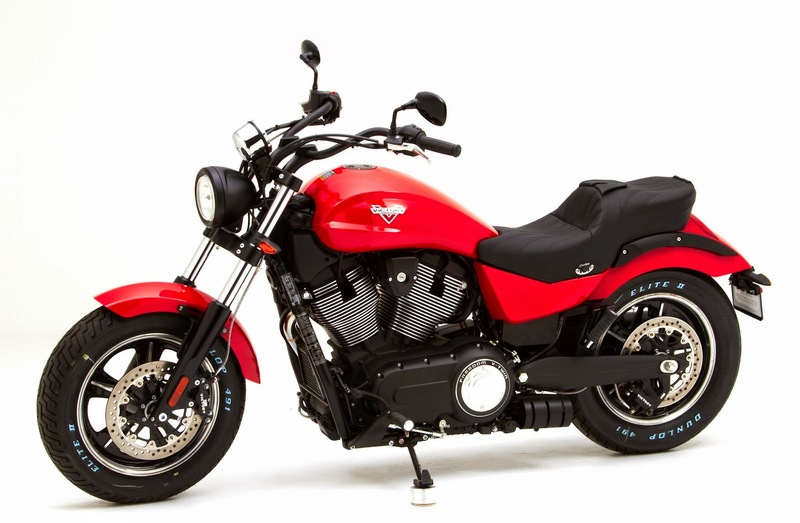 Notice how both seating platforms are sculpted to fit the shape of the human body and seat the rider lower into the bike. This is what we call "ergonomic" design and it is one of the critical features of the Corbin saddle. Wide, dished platforms create more square inches of body contact and longer lasting support without hot spots. Lower seating position provides good ground reach and makes you feel more integrated with the bike. Inside, our exclusive Comfort Cell foam provides a firm, resilient ride that lasts. Over time, Comfort Cell will adapt to your body and provide a personalized fit for even greater comfort. For those chilly morning rides, Corbin offers optional heated rider seating. A heater unit is incorporated under the leather seating and a switch on the left side of the saddle (so you can turn it on without removing your hand from the throttle). Just flip the switch and the seats will warm up and maintain temperature automatically. Corbin's heater comes completely pre-installed in the saddle and you need only integrate the included pigtail to your battery. Notice how the saddle is designed to fit perfectly to the tank, chassis and fender... Corbin's Wizards have mastered where the leather meets the metal. This kind of fit is available only in genuine Corbin saddles through our patented Integrated Molding system. This process allows us to engineer extremely tight tolerances and fit complex shapes like the beautiful, flowing fender. We found the stock seat was designed too low to provide good long range comfort and put too much bend in your knees. As such, the Corbin Dual Tour is built slightly taller to allow more rider room and straighten your legs. For those interested in obtaining more information on Corbin, you can reach them at 800-538-7035 or online at www.corbin.com. Visit Corbin Headquarters at 2360 Technology Parkway, Hollister, CA. 95023 or Corbin Florida at 1433 US Highway 1, Ormond Beach, FL 32174.